With advancing age, comes change. However, the changes that occur are accelerated or stalled depending on our actions. Whatever we continually put into play mentally and physically becomes our world…including our health – the foundation of all other things. Wearing glasses and hearing aids and engaging in cosmetic surgical procedures as well as dying one’s hair are all popular and effective methods of adapting to some of the “effects” of aging. However, they only ease the effects and do nothing to stop the aging process itself. The most effective thing that can be done to “reverse the aging process” is to engage in regular strength training exercise. Muscles are the engines of our body where energy is released, power is produced and movement originates. Because the condition of our engine has a lot to do with the way we look, feel and function, strong muscles are very advantageous and the only way to get strong muscles is to use them. Muscle mass is mandatory for healthy living and longevity. But, the reality is, you and I (and everyone else) have been losing muscle and gaining fat every day since sometime in our twenties and studies reveal that most of this muscle loss is due to the fact that we’ve stopped doing active things that require muscle power – not because we age. This gradual loss of muscle mass starts a vicious cycle as it weakens the entire body. The immune system, nerve cells, hormones and other chemicals are all negatively affected. The truth is, if you are not building muscle, then you’re losing it. If your body is not receiving the necessary stimulus to trigger muscle growth, a slow process of muscle atrophy or wasting begins. This loss of muscle tissue directly or indirectly causes the degenerative processes and conditions that characterize the aging process. In other words, lack of movement is devastating to the human body. Since most of us are employed in jobs that don’t require maximum use of our muscles, we need to create avenues that actively engage and put them to use. Strength training is the answer. 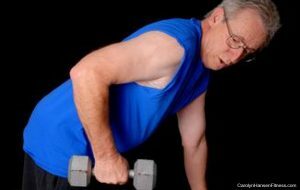 Only strength training can prevent age-related muscle loss. No other form of exercise or physical activity is adequate. Strength training is not only the most effective exercise in addressing the biomarkers that affect how young we look, but more importantly, how young we feel. It is empowered to reverse many components of the aging process and is probably the single most effective way to lengthen life. Although aerobic activity helps your heart (the most effective fitness programs consist of strengthening component and a cardiovascular component), they alone fail to stop muscle loss. Just being “active” is not enough either. Becoming stronger is key. It’s what helps you remain active for your entire life. Strength training makes you stronger and improves the quality of your life no matter when you begin. Even if you are currently enjoying your nineties, strength training can add valuable, active years to your life. In fact, six months of proper strength training has the power to turn back one of the body’s molecular clocks and rejuvenate aging muscles to the extent that they are nearly as powerful as those found in someone much younger. If you’ve been searching for the perfect anti-aging pill, search no more. Proper strength training exercise can rejuvenate and take years off your chronological age and it’s all natural. In other words, proper exercise adds years to your life and life to your years. It does not matter if you are a 40-year-old runner or 75-year-old retiree when you begin. Strength is not a luxury as we age. Increasing strength is now a proven way to make the aging process turn around at the genetic level within the cell. It is an absolute necessity for longevity and health. Strong muscles lead to strong bones and increased bone mineral density. Those that age well and seem younger than their years, retain their lean tissue mass and have a longer life, fewer illnesses, and better mental functioning. The right exercise program will increase your lean muscle mass, and your metabolic rate – burning more calories and producing more energy. This is the real secret to turning back the aging clock. Your body has the potential and the power, to slow down the aging process and restore itself to a level of wellness that it may no longer be experiencing. Superior health. the kind that pays off long-term, involves maintaining healthy body weight throughout life, eating a healthy diet, and having sufficient physical activity in our lives. The information here, when implemented as suggested, will be life changing and you will enjoy greater health like never before.